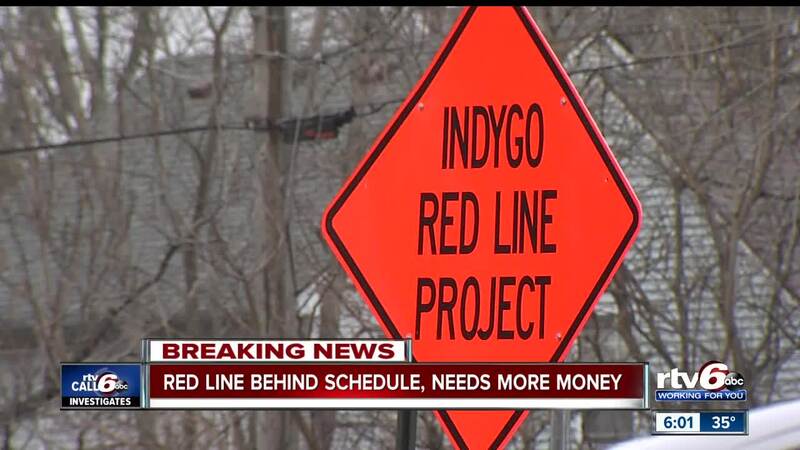 Work on IndyGo's Red Line is behind schedule and in need of additional funding. INDIANAPOLIS — IndyGo’s Red Line project is months behind schedule and millions of dollars is being spent to speed up construction, Call 6 Investigates has learned. According to documents, the construction is currently 114 days behind schedule. The delays are being blamed on delays in federal funding and relocation of utilities. IndyGo’s Board of Directors met Tuesday afternoon in a reconvened board meeting to discuss making major changes to the construction schedule and to authorize more than $3.5 million in funds to accelerate the construction to complete the project on time. The extra money will come from existing project contingency funds that were built into the project. The acceleration plan would allow construction to be complete by July 31. The $3.5 million would pay for additional labor and supervision including overtime and weekend premiums, direct costs for additional materials and performance incentives for meeting the new schedule. In Tuesday’s board meeting, Justin Stuehrenberg, IndyGo’s vice president of planning & capital projects, answered questions from the board of directors. Stuehrenberg said there could be more “slight” delays due to the weather or other unknowns, but said he is confident that this new timeline will remain on track. The board also questioned Stuehrenberg about the delivery of the buses for the Red Line. While they are on order, there have also been delays and they are still waiting on a final timeline on when the buses are expected to be delivered. “I don’t think we’ve thought through acceptable risk," board member Richard Wilson said.